Create your own letterhead, choose individual salutations for each guest and edit the default texts in the preferences of Lodgit Desk. Creating and printing an offer, a confirmation or an invoice is done with just a few clicks. From advertising mailings to offers, confirmations (incl. 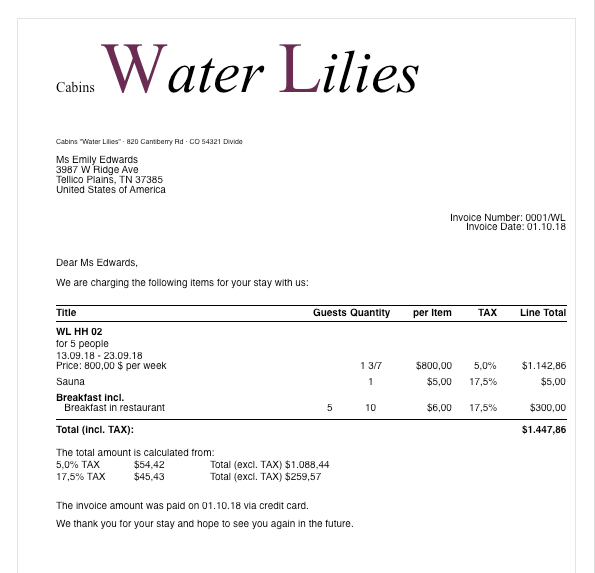 return confirmations) and hotel invoices: Lodgit Desk can take care of the entire correspondence with your guests nearly automatically. 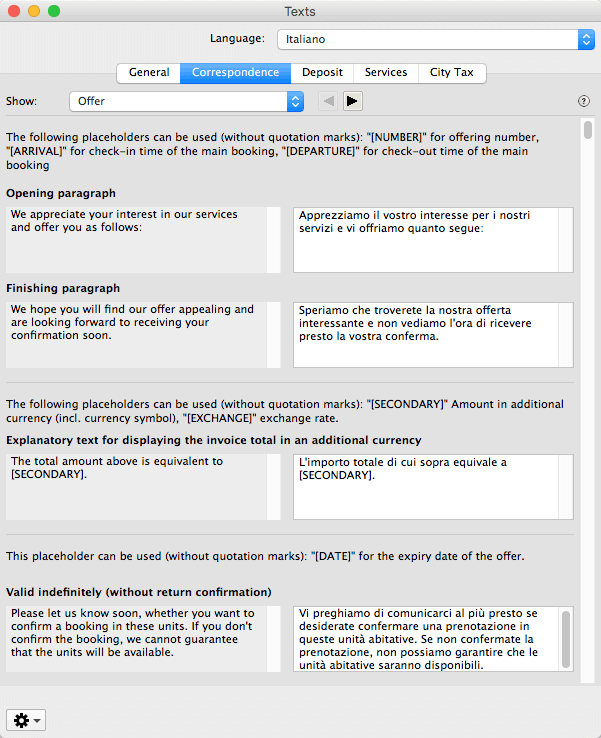 With Lodgit Desk you can easily create multilingual text templates for offers, confirmations, invoices and other correspondence. You can save multiple different opening and finishing paragraphs in the templates to reuse them again later by simply choosing them when creating e.g. an offer. 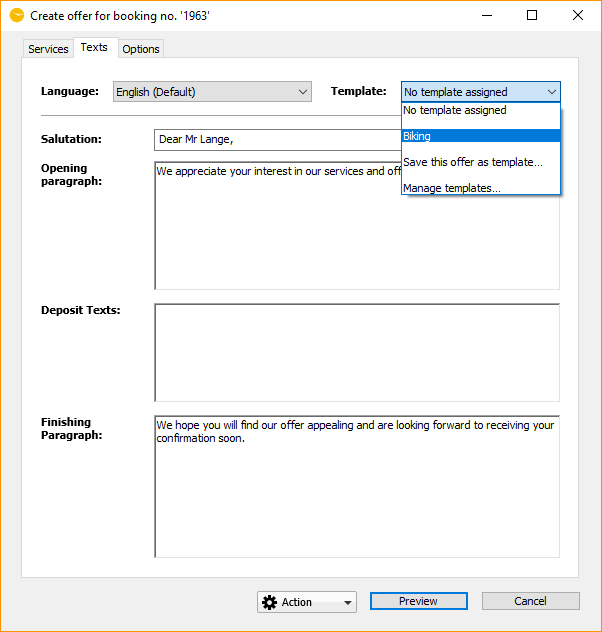 Hint: English, Spanish and German language templates are already present in Lodgit Desk so that you only need to translate the names of the extra items you created. 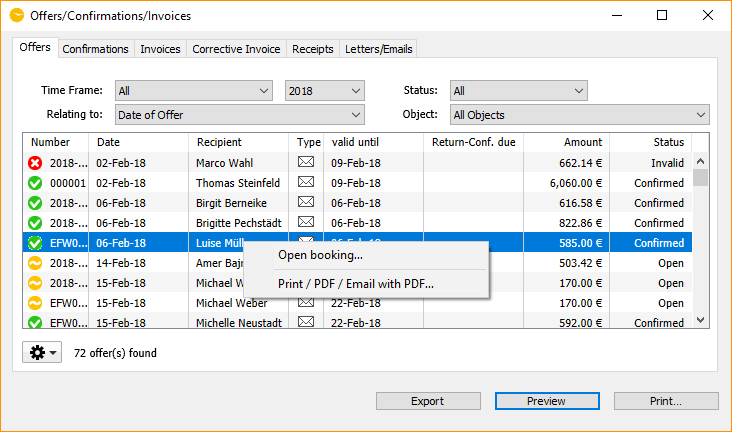 What's great for your guests from abroad: With Lodgit Desk you can create templates for offers, confirmations and invoices in multiple languages. They will be used automatically according to the language settings of the respective guest which can be determined in the guest management. This way you can automatically send correspondence to your guests in their native language. Special offers: To get more bookings off season you decide to send an offer to selected regular guests with a 20% discount voucher. Seasonal offers: A template for a christmas special offer could for example contain the extra items for a four course menu and a nightly sleigh ride which you can set up as a package in Lodgit Desk. Full packages: Templates for inclusive extra items as usually offered by hotels can for example breakfast (garni), half- or full board and can also be set up in Lodgit Desk as a package.